Frozen carbon dioxide (C02), the gas that we exhale when breathing is called dry ice. It is much denser and colder than traditional ice. 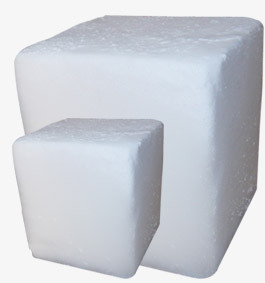 Dry ice is -109.3º F (-78.5º C) in comparison to traditional ice that is 32º F (0º C). Another feature of dry ice is that it doesn't melt – it sublimates, in other words it is going directly from a solid to a gas. It avoids the liquid form, that’s why it obtained such a name – “dry” ice. This makes dry ice extremely useful in food preservation, packaging, and transportation. Dry ice stops salmonella growth by preventing heat build-up. It blocks moisture build-up in mixing and water weight loss of products during shipment. Besides, its inert carbon dioxide gas is a great preservative, hindering the growth of many bacteria forms. Not only dry ice is applied in food industry, it is also extremely useful for flash freezing, pharmaceutical packing, refrigeration leaks, ammonia absorbing, and producing fog for the entertainment industry.